Tips & Advice for female passengers/riders? Safety suggestions. We know there are circumstances when you do not have another choice but to take an Uber of Lyft by yourself. However, we encourage you to ride with others whenever you can to reduce your risk of harm. The more people you ride with, the more likely someone will be sure to check the details of the driver and vehicle are in fact correct, and there is strength in numbers if the driver were thinking about planning an abduction. All rideshare companies (Uber, Lyft, Juno, Via, etc.) will give you your driver’s information prior to their arrival. You will be given a profile of your driver that includes their name, Uber rating, and specific information about their vehicle (car type, color, and license plate). It is important to check the make/model of the vehicle to see if it matches before getting into the vehicle. If you’re not a car expert and can’t tell the difference between a Toyota Corolla and Toyota Camry, don’t worry, you can ALWAYS check the license plate to make sure it matches the information in your app. 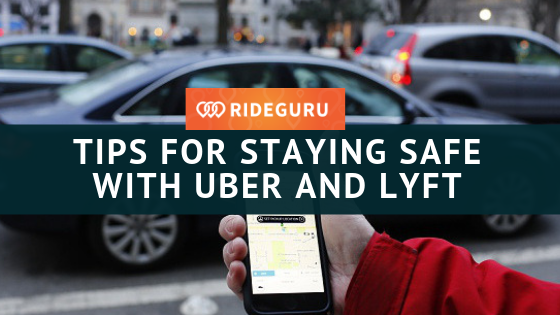 Before getting into the rideshare, approach the driver and signal them to roll down the window of the car. Ask the driver to recite your name before you open the back door and get into the car. All drivers will have access to your profile as well, so if they tell you they are not sure or don’t have that information, they are a fake! 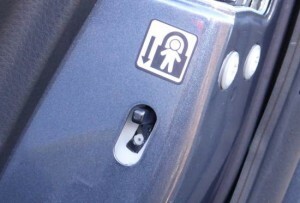 If the lock is up – do not get in the car! This disables you from opening the door from the inside out. One way to make sure you are being extra safe when calling an Uber of Lyft is to wait inside until you know your driver is approaching shortly. Some predators see people waiting on the curbside for rides, and see them as potential targets. They realize a lot of people have likely called a rideshare home, and they can use that to trick you into believing they are your driver. The less time you are hanging around on the curbside looking aimlessly, the less likely you will be a target to this type of predator. While you’re waiting inside, you can familiarize yourself with the details of the driver and vehicle to be ready for a quick screening once the car arrives. Lastly, we strongly recommend using the features available to alert trusted friends and family members when you are riding alone. In the Uber app, you have the ability to share all of your ride with up to 5 of what are called Trusted Contacts. Open your Uber app. Press the menu button on the top left of the screen. Click on Settings -> Manage Trusted Contacts. Uber lets you add people directly from your contact list. Every time you take a trip, the app will prompt you to alert your trusted contacts. Having a trusted contact ensures that someone can track your trip and always has an idea of your whereabouts. If you are using another app like Lyft, which does not have a Trusted Contact feature like Uber does, we would recommend taking a screenshot of the details of your trip and driver, and sharing that information along with your location through other means with people you trust. At RideGuru, we want to avoid as many future incidents like the tragedy of Samantha Josephson as possible. So please, share with friends, family, relatives, and anyone who would benefit from these safety guidelines. ← Should I Let My College Student Ride in an Uber or Lyft?